The armored catfish is abundant and destructive in Florida, Texas, and Mexico. 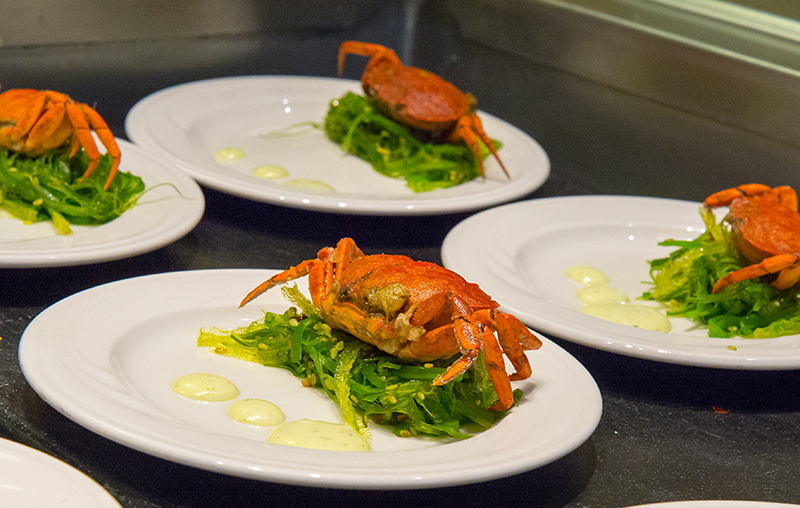 Cast your nets for these flavorful natives of the Amazon. 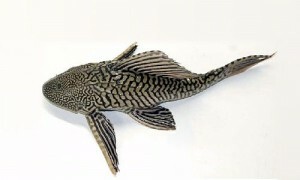 Description: Covered in bony plates, the armored catfish has a triangular shape, with a smooth bottom, spotted in a leopard pattern. Mouth lacks teeth. Scrapes algae from submerged tree trunks, rocks, and river bottoms. Its “suckermouth” can also affix to surfaces in strong currents. Call it the “Nemo Effect.” The armored catfish is a popular aquarium fish, attractive to many aquarists because it scrapes algae from the bottom and sides of tanks. Invasive armored catfish have been found in Florida since at least the 1950s in the rivers around Tampa, and they have been recorded in Texas since the 1960s. They were first seen in Mexico about 15 years ago in the Reservoir El Infiernillo in Michoacán in central Mexico. In many cases, the most likely explanation is that aquarium owners released this native of the Amazon into wild waterways. It has also been intentionally released in Mexico to control algae. The fish has since spread to at least 13 Mexican states, displacing native species and devastating thousands of Mexican families that depend on fishing for income. Owing to its ugliness–and with little information on what to do with it–people refused to consume armored catfish, believing it poisonous. Because of the economic destruction and general upset the catfish caused, Mexican fishermen named it pez diablo or devil fish. The armored catfish lives in freshwater but can tolerate moderate salinity. Thanks to a vascularized stomach, which allows it to breathe air, it can survive in low-oxygen waters, gulping air and surviving out of water for more than 30 hours. 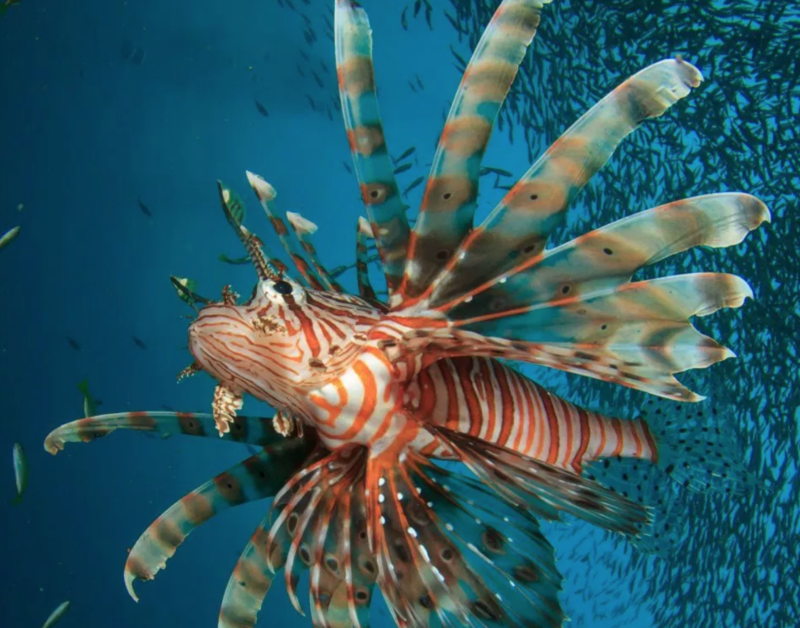 Its bony spines aren’t poisonous; they’re used as a defense to ward off predators. Scared or threatened, the armored catfish extends its fins to avoid being swallowed. Predators include fish, birds, river otters, and crocodiles. Adult armored catfish range from 12 to 20 inches in length and weigh about 1.5 to 2.5 pounds. They’re nocturnal, with eyes adapted to low light. Twice a year, females lay several thousand eggs in nests or tunnels burrowed into riverbanks–nests that can be three-feet deep and destructive to banks. They’re highly territorial. Males also stick around to protect the nest. 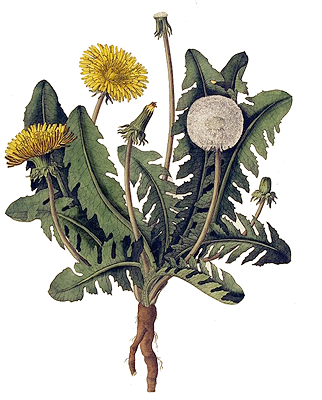 These adaptations have made them successful invasives. In some Texas rivers, armored catfish have been found to make up more than 50% of the total fish biomass. After Hurricane Irma in Florida, they were spotted swimming around flooded driveways and yards. The expansion of the catfish comes at the expense of native freshwater species. In Mexico, many species, such as the once common mojarra, lay eggs in algae along river and lagoon bottoms. The pez diablo consumes the algae and the eggs, and the natives begin to disappear. Though it is reviled throughout Mexico, the armored catfish remains popular in freshwater aquariums and is found in many aquarium stores in the US. 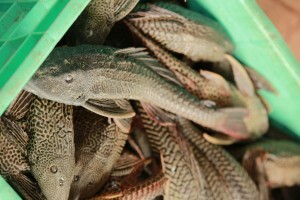 The armored catfish is consumed in its native South America, especially in rural areas. It’s sold live in markets and eaten whole, grilled, or in soups. In Brazil, armored catfish is also ground into piracui, or fish meal, which is combined with olive oil, onion, and cassava flour to make fried dumplings. In Mexico, state and local government initiatives have had mixed success. Projects have attempted to process armored catfish into fish meal for animal feed or fertilizers, but due to high capital costs and the low cost of fishmeal, such projects haven’t passed the pilot level. Public awareness campaigns and community workshops have helped to promote local consumption, though the demand and market for the fish remain low. 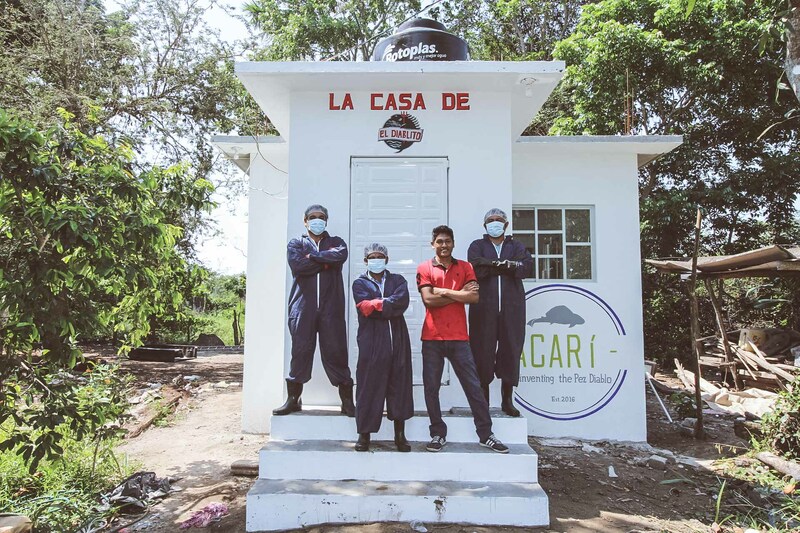 The Mexican social enterprise Acarí, based in Tabasco, has started to process and market fillets on an industrial scale; it supplies restaurants and corporate kitchens in Tabasco and Mexico City. The company trains local fishermen, installs the necessary equipment, and purchases the fillets from fishing communities. It started exporting El Diablito fish jerky to the US in 2018. People have been harvesting armored catfish in Florida and Texas for years, but to date, there is no market for the fish. Although harvest can have benefits, the most important control is to prevent aquarists and fishers from releasing aquarium or wild-caught fish. Armored catfish are typically caught with cast nets or drift nets. They do not tend to take bait and are rarely caught on hook and line. One novel technique is to disturb the nests of breeding catfish, with a pole and net. The hard exterior can seem daunting for filleting, but the fish has a soft spot next to its dorsal fin. Insert the knife in beneath the fin and follow the spine toward the tail. At the tail, make a small, outward diagonal cut. Make the same diagonal cut by the head, and the flank will open up. Use the tip of the knife to clean off some of the capillaries, and insert it about half an inch, between the thick skin and fillet. Using your thumb, slowly pull the fillet off the skin, like peeling an orange. Armored catfish have high hemoglobin content, which gives them a firm, hardy texture. The meat is a great substitute for ground meats in burgers, meatballs, or empanadas. Some fishers just open up the belly to take out the guts and then grill or roast the fish whole. The thick skin works well to trap the juices. Once done, you can just peel off the skin and eat. Armored catfish have bony plates, not scales. These plates can shred your hands, so we recommend using gloves, but grabbing the catfish by the head also works. Its head is smooth and won’t scratch you up like the bony plates. Grind the filet in a grinder or blender. Mix herbs in well. If necessary, grind or blend again with the herbs. Add salt, pepper, and egg. Mix well, then divide the mixture to form meatballs with your hands, about 2 or 3 ounces per meatball. Place them on a plate and leave in the fridge while you prepare the sauce. Blend all ingredients except potato until they form a smooth sauce. Add sauce to a saucepan on low heat and season. Once the sauce begins to bubble, add potato, then meatballs. 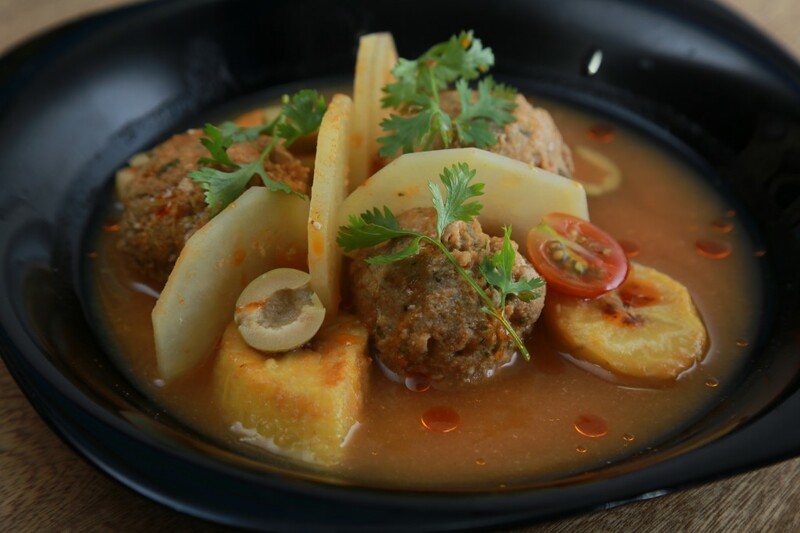 Cover saucepan and let meatballs and potato cook on low heat for about 10 to 12 minutes. Grind fillet in a grinder or blender. Add herbs, garlic, and bacon. Blend again. Add salt, pepper and finely chopped red onion. Form the burgers with your hands, about 2 or 3 ounces (a handful) each. Beat the eggs. Lightly dust the burger in flour, then dip in the eggs, and coat breadcrumbs. Set on plate and refrigerate for at least 30 minutes. Heat vegetable oil in a large saucepan. Add the burgers. Cook 3 to 4 minutes per side, or until golden brown and cooked through. Remove burger from pan and place on paper towels to absorb excess oil. 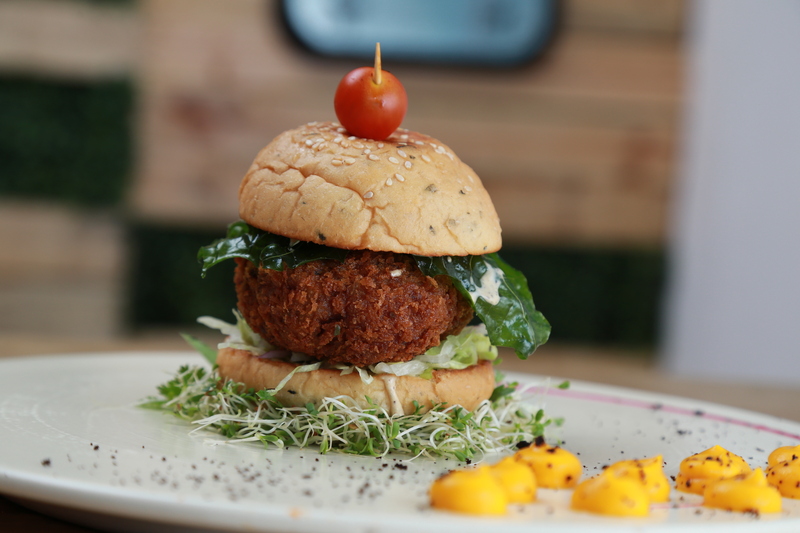 Burgers can be served with tomatoes, lettuce, cheese, or any fixing you prefer.